PEACHTREE CITY, January 25, 2019 – The Southern Conservation Trust, a Georgia based land conservation organization working to protect vital habitats and resources, today announces that they have conserved nearly 16,000 acres in 2018 alone, doubling their acreage conserved. This brings their total acreage conserved to over 32,000 acres in just two and a half years. Their small team of only five, all millennials, is one of the fastest growing land trusts in the southeast. In 2018, the Trust conserved land in Georgia, Tennessee, North Carolina, South Carolina, and Alabama. Conserved properties include vital coastal habitats, granite outcroppings, forests, frontage on the Flint River and Chattahoochee River, wetlands, working farmland, historic areas, and so much more. These properties will be forever protected, saving habitats for dolphins, migratory birds, black bears, elk, gopher tortoises, and numerous other wildlife species. “Every single year we are amazed at the generosity of those donating conservation easements,” said Katie Pace, who became SCT’s Executive Director in late 2016. “Conserving land and providing environmental education is the primary focus of the organization, and we are thankful we have protected over 32,000 acres of habitats across the southeast. The Southern Conservation Trust elevates nature through exceptional stewardship through over 32,000 acres of conserved land throughout the Southeast, as well as 7 public nature areas in Fayette County, Georgia. www.sctlandtrust.org. 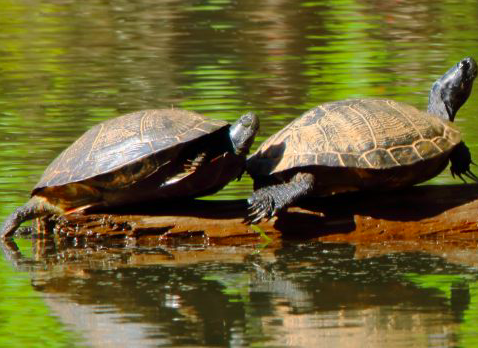 Photograph of turtles taken by Marlene Koslowsky at the Southern Conservation Trust’s Line Creek Nature Area.